The Howard Miller 620-257 J.H. 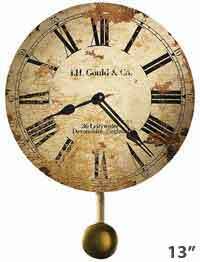 Gould And Co. II has a beautifully reproduced 13 inch diameter antique dial carefully mounted on laser cut ¼" thick panel bases. Featuring antique style black hands and an accurate quartz movement. Antique pendulum swings back and forth and has no effect on time keeping. 18-1/2" tall. Recapture the past and celebrate the timeless essence of Old World craftsmanship. One Year warranty and Free Shipping. 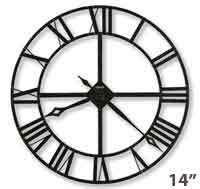 The Lacy II is a 14" diameter wrought iron wall clock features stamped Roman numerals, finished in dark charcoal gray with silver edging. The hands are finished in charcoal gray with silver edging. Accurate Quartz movement requires one AA battery.. One year warranty. Size: Dia. 14" D. 1-1/2"
This popular Moment in Time dial is elegantly framed in an antique brass bezel, while a decorative antique brass pendulum swings below. Battery operated quartz movement and 1 year warranty. Antique Brass finish. Auto Daylight-Savings Time Movement. Size: H. 21" Dia. 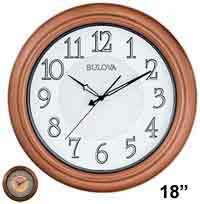 15"
This 15-1/4" larger diameter wall clock features a medium-brown brown resin case with a charcoal gray bezel. Dial is off-white with charcoal gray Arabic numerals and spade hands. Quartz, battery operated movement with Auto Daylight Savings adjustment. Auto Daylight-Savings movement automatically adjusts for Daylight Savings Time. The hands of the clock follow an LCD display on the back of the clock and make corrections to keep the correct time including Daylight Saving Time corrections. Requires 1 AA battery (not included). One year warranty and Free Shipping. Size: Dia. 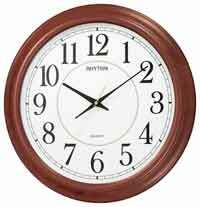 15-1/4" D. 1-1/2"
The Seiko QXM548BLH Dillon Musical Wall Clock is a traditional large 15" diameter clock with a Cherry frame. It has large black easy to read arabic numbers and in place of the 6 is a swinging pendulum. The black spade hands are a good contrast to the white face. This melody clock has 3 sets of 6 songs each devided into Popular, Classic, and Christmas. Indoor/Outdoor Clock. Weather-resistant cast resin case with satin aged bronze finish. Open lattice detail with three-dimensional center floral design and contrasting metal hands. Quartz movement. Requires (1) AA battery, not included. One year warranty and Free Shipping. The Bulova C4823 Navigator Wall Clock has a dark metal case with a weathered finish. 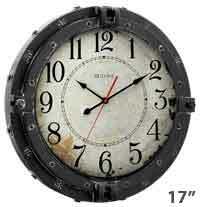 The antiqued porthole design features rivets and bolts all around the frame. The dial has a weathered look as if it has been trolling the high seas for years. The 13" dial has 1 1/2" high Arabic numerals with black arrow hands and a red quiet sweep second hand. A protective glass lens covers the dial. The accurate quartz movement requires (1) AA battery. One Year Warranty and Free Shipping. Size: Dia. 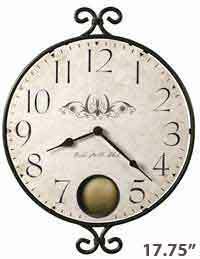 : 17" D: 2.5"
The Howard Miller 625-350 Randall Wall Clock offers a round wrought iron frame with a warm gray finish surrounds an antiqued dial with aged Arabic numerals. A peep hole at the “six” position allows a view of the antique brass swinging pendulum. Quartz, battery operated movement. One Year warranty and Free Shipping. 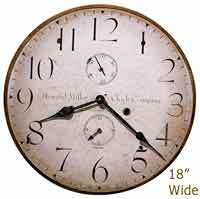 Diameter 14" H. 17-3/4" D. 2-1/4"
The Rhythm Clocks Sterling Open Hand Wall Clock is a modern, large wall clock with open hands. Raised silver-tone numbers and time-track give this clock dimension. Clock can be set for quiet operation or play 1 of six classical melodies, 1 of six folk and classic melodies or 1 of six Christmas melodies on the hour. One year warranty and Free Shipping. The Bulova Providence Illuminated Wall Clock features a classic look with a multi-step molded case and aged copper finish. The fully gasketed case and compartment protects against the elements and resist moisture and humidity. The large 2" numbers are easy to read in the daylight as well as at night when they are back-lit. Quiet-Sweep Quartz battery operated movement Requires (1) AA battery for clock, (4) D cell batteries for light, not included. Free Shipping and One Year Warranty. Size: Diameter. : 18" Depth: 2.5"
Antique Reproduction beautifully produced with fade-resistant inks printed on a flat, open face 1/4' panel. This 18" Open Hand, antique dial is carefully mounted on laser cut, 1/4" thick, panel bases and feature antique open black hands and a quartz movement. Second track and dual hour track movement. The Tephra has a wood frame with a dark cherry finish and a mediterranean design. It has a fired domed amber glass dial, curved hands and cut-out hour markers. Requires (1) AA battery. One Year Warranty and Free Shipping. Size: Dia. 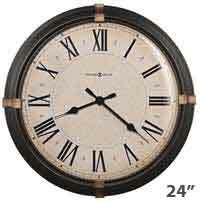 : 18", D: 2.75"
This Clock comes with a metal oiled Bronze finish case. Individual ogee shaped leaf pieces forms a unique pattern. Antique dial with large multi-colored accents euro-style Arabic numerals, protective glass lens. Requires (1) AA battery, not included. One year warranty and Free Shipping. 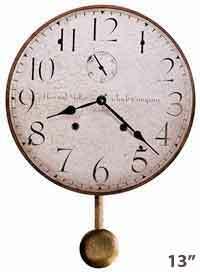 Size: Width 17 3/4", Depth 3 1/2"
The character of a rusted, antique timepiece is evident in this 21" molded polyresin wall clock. Aged hour and minute hands add to the appeal of the authentic look. Quartz, battery operated movement. 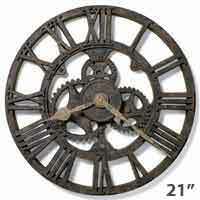 This antique style wrought iron wall clock is finished in aged iron with antique gold finished outer ring. 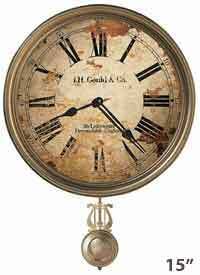 Antique gold finished diamond shapes and Roman numerals mark the 12, 3, 6, and 9 hours. Antique gold hour and minute hands. Quartz, battery operated movement. Our largest Non-Ticking Wall Clock! 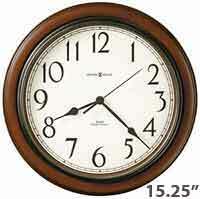 The Admiral large wall clock by Rhythm Clocks offers a solid wood frame in a Cherry finish with glass crystal cover. 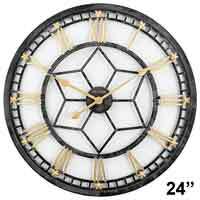 This clock is an impressive 22" in diameter and is equipped with Rhythm's ultra quiet smooth second hand. NON-TICKING, accurate Quiet Sweep quartz movement. Large, easy to read dial with black Arabic numerals on a white background with a minute track and second hand. 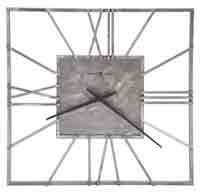 Howard Miller Sunburst II 625-543 Wall Clock This 22-1/2" wall clock is designed for indoor or outdoor use. The sunburst frame is made of metal with a powder-coated case burnished metal finish, tempered glass, and rubber seals protect the inside of the clock from inclement weather. Two additional dials indicate temperature and relative humidity. An off-white dial features black Arabic numerals and black hour and minute hands. Quartz, battery-operated movement. Requires 1AA battery. One year warranty and Free shipping. Size: Dia. 22-1/2'' , D. 2-1/2'' . Size: Width 24" Depth 3". 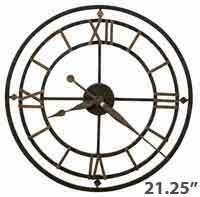 This 24" large metal Large Wall Clock is finished in a dark rubbed bronze with aged bronze accents at the 3, 6, 9 and 12 positions. The aged dial features a subtle center pattern, aged black Roman numerals, black spade hour and minute hands and a convex glass crystal. A twisted metal ring frames the dial. Quartz, battery operated movement. One year warranty and Free Shipping. Size Dia. 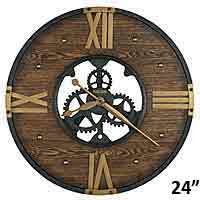 24", D. 3-1/2"
This handsome, oversized wrought iron wall clock is 24" in diameter and features a textured matte black finish. The Ash veneered numeral ring is finished in a dark aged oak and surrounds decorative fixed, matte black finished gears in the open center. The dial includes applied metal numerals at the 12, 3, 6 and 9 positions; round hour markers; and hour and minute hands—all finished in antique brass. Quartz, battery-operated movement requires one AA sized battery (not included). One year warranty and Free Shipping. Size: Diameter 24", Depth 2.75". 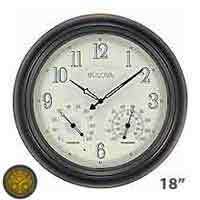 Bulova C4817 Conductor oversized wall clock looks as though it came from a train station of years past. The aged black case finish has a raised bezel design and looks as if it has been in the weather since the 1860's. The glass lens covers the weathered dial showing the 1800's period numerals and Central Pacific railroad company. The silent quartz movement has a smooth sweep seconds hand. Accurate Quartz movement requires (1)AA battery. One Year Warranty and Free Shipping. 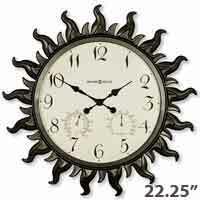 Size: H: 24"" W: 24"" D: 2""
Indoor/Outdoor Clock. All-weather, fully gasketed metal case in aged-wicker finish. Large numerals on full dial, and responsive white LEDs automatically turn on/off from sundown to sunup. Protective glass lens. Quartz movement. Requires (1) AA battery for clock, (4) D batteries for LEDs, not included. One Year Warranty and Free Shipping. 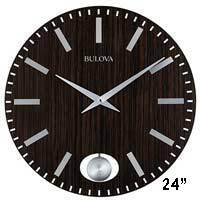 Size: Diameter: 24", Depth: 3"
The Bulova Manhattan Wall Clock has a beautiful contemporary design. This clock is made of MDF with a zebrawood-finished top. The sides and back are finished in brown-cherry. The face has brushed silver hour markers and leaf hands. In place of the hour marker at the 6 o’clock position there is a peek-a-boo slow-swing pendulum. The accurate Quartz movement requires (3) AA batteries, not included. Free Shipping and One Year Warranty. Size: Diameter. : 24" Depth: 1.75"